The tranquility of Australia's outback on the edge of the city. The region is welcoming and uncomplicated to the independent traveller with its wide range of unique natural features and services. Once you are placed in this central region of peace and freedom with nature it's hard to imagine that Adelaide and the northern suburbs is only one hour distant, or that mainstream tourism can be accessed in all directions with a very short time. The region is commonly known as the Murray Plains and has three distinct phases of human occupation, being; the Aboriginal native, British pastoralists 1840's and germanic close settlement 1870s to date. 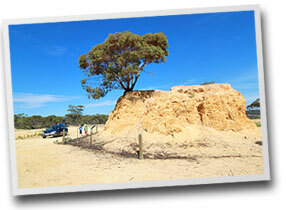 Although this is an ancient land its present shallow soil and flora known as mallee is only a relatively recent development from the Pleistocene period of the last 10,000 years following the recession of sea levels. Calcareous fossils are discernible throughout the entire region. Nearby you'll find the ancient Shell Hill. Most of this region was the province of the Ngaiawang tribe who numbered approximately 1200 prior to the arrival of the Europeans in the 1830's. Natural land forms designated boundaries between neighbouring tribes such as the Nganguruku south of the beautiful Marne Valley and the Peramangk and Ngadjuri west and northwest along the Barossa Ranges. Tribal occupation of the region is believed to exceed 27,000 years with the Ngaiawang being the last who replaced an earlier tribe of the so called Tartanga 7,000 years ago. BLACK HILL was first settled in 1890. The township is situated some 110 kms north east of Adelaide, nestled in a valley on the River Marne, named after a sister river in France. Black Hill which was named FRIEDENSTHAL (Valley of Peace) prior to World War 1 was first owned as a station by Thomas R Reynolds. In 1891, this land was subdivided and purchased by families, many of whom still have descendants living at Black Hill today. The name Black Hill was derived from the native pines on the granite hill, as these trees together with the black granite accentuated the hills for many miles. Very few places in South Australia can match the superb spread of eucalypltus along the Marne Valley. 500 Feet above sea level. Estimated Granite was formed 500 million years ago. Granite is uniform in texture, rich black in colour. There are 2 commercial quarries. The first one started in 1947. The second in 1968. Weight 3.5 Tonne per cubic metre. Sold to all parts of Australia, New Zealand, Japan and America. Granite has been featured in the former building of John Martins and David Jones (Adelaide). The new Parliament House and the Library both in Canberra. Sienna Brown granite used as cobblestones in the fore - court of the Sydney Opera House. Up to 20 people are employed at the rocks. So named because of the deposit of oyster shells - some places were up to 20 feet thick. Formerly part of a shallow sea occupying the Murray-Darling Basin. Due to storms and slow sinking of basin the oysters would die and would be covered with another layer building up over thousands of years. The South Australian Museum inspected the hill in the early 1970's, activities such as the use by farmers of the shell in conjuction with super phosphates, and the use by councils for road building, have been stopped. The crushing plant in the gully near by was built in 1930. 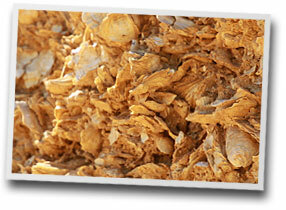 Driven by a large kerosine engine, turning oyster shells into a fine powder - used as a Fertiliser. The late Sir Thomas Playford (a former State Premier of South Australia) used a quantity for his orchards in the Adelaide Hills. The plant was closed during World War 2 and re - opened in 1942 and finally closed in 1946. My late father (Len Batten) worked there during the war years.